It’s great to glean wisdom from the Bible through sermons, devotions, and other people’s insights- and though these sources may expand your knowledge of the Scriptures in wonderful ways that may, indeed, help you, please don’t let that those be your primary resources when it comes to studying God’s word. Nothing beats the personal knowledge and the relationship that develops, between you and the Author, when you spend time, one-on-one with the Bible. It CAN feel clumsy at times. I get it. The Bible is not like any other book- but we can learn techniques that will help us to understand it better. One idea I get from this verse is that, because the word of God is “living and active” it’s not a book that we read once and call it good. I’ve been reading the Bible on an almost daily basis for a long time- and there are certain verses that I’ve heard, seen, or read thousands of times. I may think I fully understand those verses, but then, out-of the-blue, I’ll be read or hear it, again, and the Holy Spirit will show me something new. It’s a beautiful thing. The Holy Spirit wants to speak to you, too. Quiet you mind, inviting him to speak (with a simple prayer) and opening the Bible are all ways that you can be hospitable to his voice. Holy Spirit, please speak to me and help me to understand what I’m about to read and apply it to my life. Use a reading plan (but don’t be a slave to it…stay open to where God leads you in your reading). I’ve created a simple 30-day plan for you to use if you like. It’s only a chapter a day but it covers some good stuff! The file above is a one that you can download to your phone, save as an image, and use as “wallpaper” on your lock screen. I like to have my reading plans on my phone, in a really obvious place, so that I’ll remember! · Have a “trigger” or some way that it’s built into your daily routine. For me, my Bible study time is always right before I begin writing. Since I write almost every day, it’s not usually something I’ll forget. · Take notes…write in the margins, mark it up! 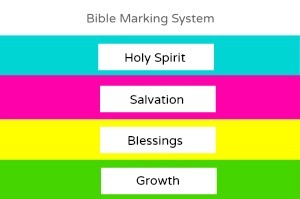 There are lots of great color-coded marking systems for highlighting that will help you. I like to use Bible Hi-Gliders because they don’t bleed through the pages. · I like the marking system because it helps me to slow down and pay attention. · Copying verses into a notebook is a helpful way to make then stick in your mind or reference them later. · Try out different versions of the Bible. My “go-to”, for years, has been the ESV, but I recently started reading The Message by Eugene Peterson- and I love it! · Some great tools to have nearby are a concordance and a commentary. I often use an online version of these on Bible Gateway but lately I’ve been trying to get away from screens during my Bible time, to avoid distractions, so I started using Halley’s Bible Handbook. Bible study is a discipline. There will be a lot of distractions that will seem to get in your way, but I encourage you to push through those distractions, making it a priority. It’s worth it! Find out what God wants to say to YOU. If you wish to leave a comment, let’s talk about some of the hindrances we have when it comes to finding daily time in God’s word- and any tips you have found to help you overcome those. *This post is a sample from, Renew: Daily Retreats for Body, Spirit, and Mind, a private online course/book that I offer for sale. If you liked what you read today, please click HERE to see how you can read more like it.